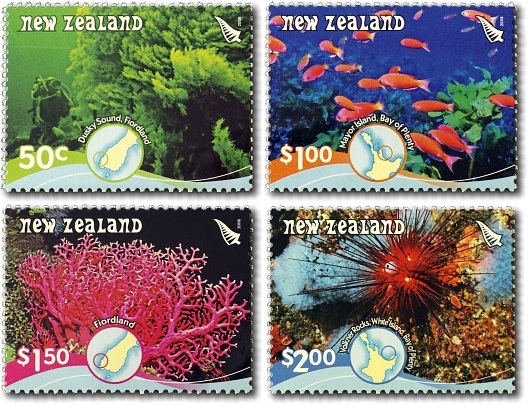 The 2008 Scenic stamp issue featured New Zealand Coral Reefs photographed by Dr Kim Westerskov. Kim Westerskov is a photographer and writer who specialises in images of aquatic and seashore life. He has a PhD in Marine Sciences from Otago University, and has written and illustrated seventeen books about the seas, sea-life, and Antarctica. 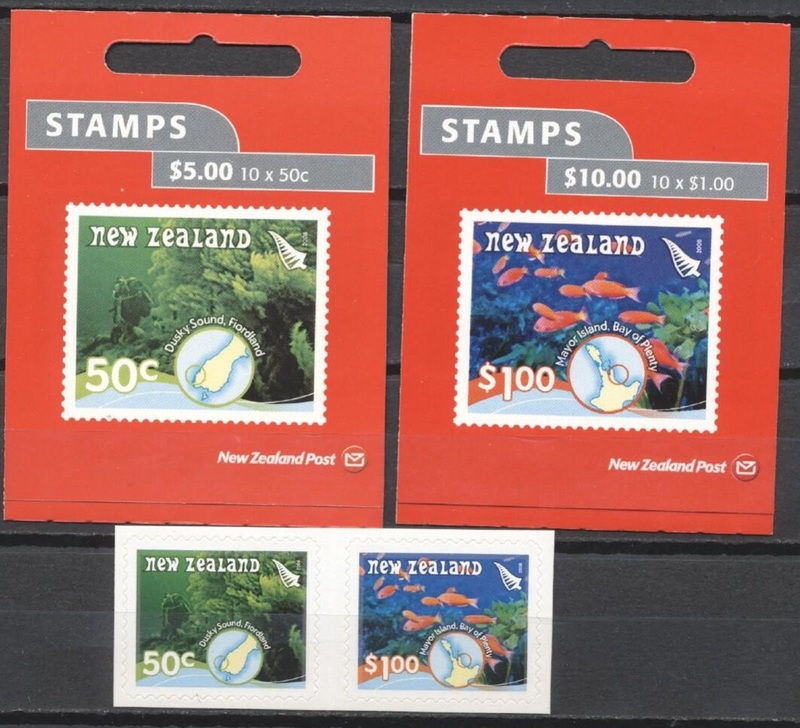 This issue features four amazingly beautiful stamps with bright vivid colours. Not sure why I have missed them before considering I even have the set in my collection. 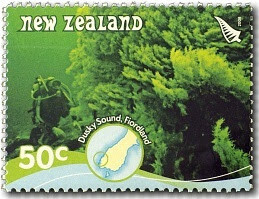 50c - Dusky Sound, Fiordland. There are about seven million colonies of black coral tree in Fiordland – and it is generally thought that they live over 300 years. The coral earned its name from its black skeleton, although its living tissue is a ghostly white. It’s usually confined to offshore islands at depths greater than 45 metres, but Fiordland’s unique aquatic conditions enable it to live at depths of typically 3-4 metres, but up to 6+ metres deep. The top few meters is fresh water, fed from high inflows from the surrounding mountains, and stained brown with tannins from the forest. Below this is a layer of cold, heavy, saline water from the sea. The dark tannins in the freshwater layer make it difficult for light to penetrate. Thus, many deep-sea species grow in the comparatively shallow depths of the Sound. 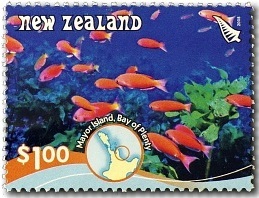 $1.00 - Mayor Island, Bay of Plenty. 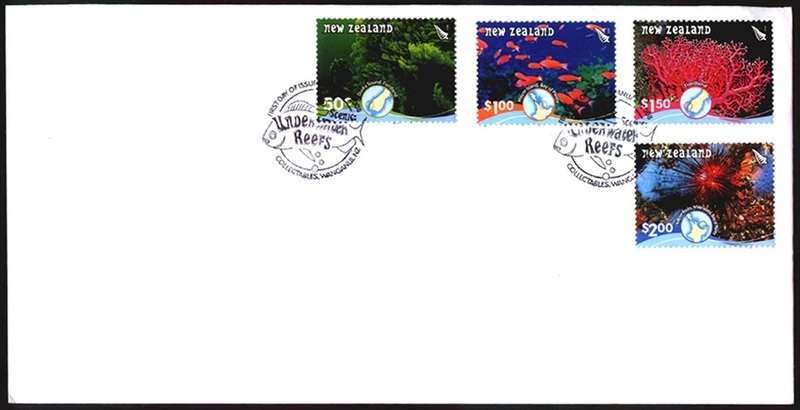 The one dollar stamp features a school of Splendid Perch (Callanthias Australis) swimming over common kelp (Ecklonia radiata) around Tuhua (Mayor Island) - a dormant shield volcano located off the Bay of Plenty coast of the North Island. The area of the Bay of Plenty around the island is renowned for game fishing, however, the island and the waters close to its shores are now a small marine reserve while the island itself is a wildlife refuge. These gorgeous fish are the aptly named splendid perch (Callanthias australis), one of New Zealand’s most colourful fish species, captured as they swim over a forest of common kelp (Ecklonia radiata). About a metre long, kelp dominates marine forests and is the preferred food of the sea urchin, kina (Evechinus chloroticus), which can sometimes eat a whole forest in one sitting. Fortunately, the kelp grows rapidly and soon replaces itself. Another Fiordland beauty, red coral (Errina novaezelandiae) is not a true coral but a related type of animal – a hydrocoral, made up of separate individuals, each with its own feeding and defence systems. 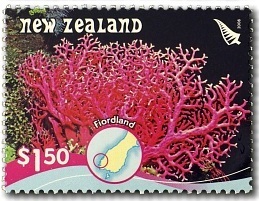 Hydrocorals usually grow only in the deep ocean, but in Fiordland, they grow at depths of 20 metres, but also at 25 metres, 15 metres and even shallower. This protected species has a rigid skeleton up to 30 centimetres long. $2.00 - Volkner Rocks, White Island, Bay of Plenty. The diadema urchin (Diadema palmeri) is one of the finest of the sea urchins, with very sharp spines that provide the perfect defence system and mean it has no natural predators. 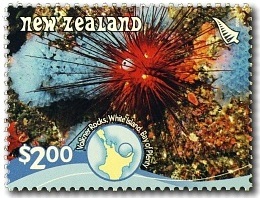 The New Zealand Diadema palmeri urchin can be found living only on steep rock faces. They have their own patches, to which they return after foraging by night. Te Paepae o Aotea (also known as the Volkner Rocks after Carl Sylvius Völkner) are a group of andesitic rock stacks and pinnacles located 5 kilometres north-west of Whakaari / White Island in the Bay of Plenty. A marine reserve was established in 2006 and the area is popular with divers due to good visibility, spectacular scenery and colourful marine life. Miniature Sheet First Day Cover - 9 January 2008. 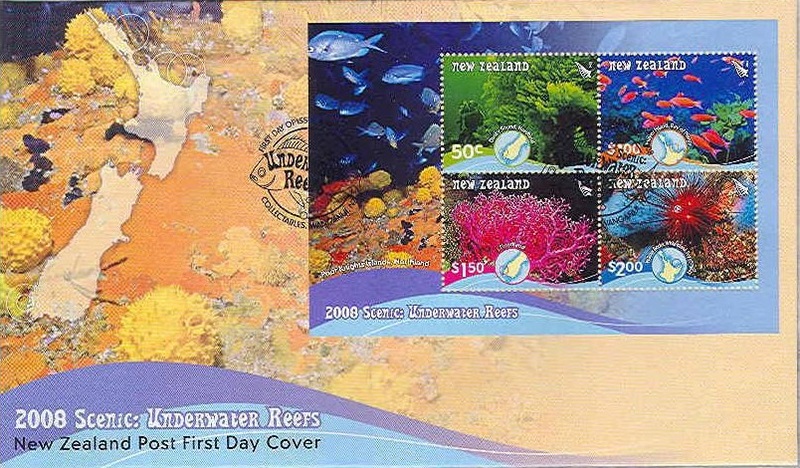 First Day Cover - 9 January 2008. 50c - Dusky Sound Self Adhesive. $1.00 - Mayor Island Self Adhesive. 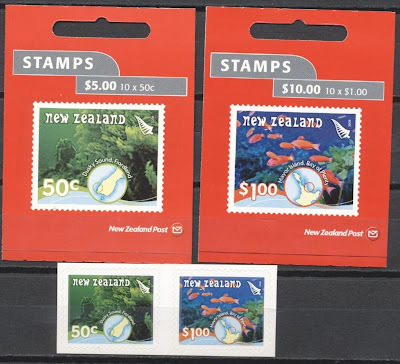 Self Adhesive Booklet of ten $1 stamps. Self Adhesive Booklet of ten 50 cent stamps.